A postcard depicting Elijah Green (ca. 1838-), a former slave, sitting in front of the Old Slave Mart, located at 6 Chalmers Street in Charleston, South Carolina. Green was said to have been born in 1838 and was one of the few ex-slaves still living in 1941. The Old Slave Mart opened in 1808 as a response to the ban on the United States' participation in the international slave trade. It served as a domestic slave collecting and reselling center until 1863. The site was placed on the U.S. National Register of Historic Places in 1973 and was acquired by the City of Charleston in 1998. "Old Slave Mart Museum." Charleston, South Carolina. http://charleston-sc.gov/index.aspx?NID=160. 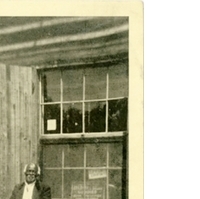 “Old Slave Market Postcard.” RICHES of Central Florida accessed April 18, 2019, https://richesmi.cah.ucf.edu/omeka/items/show/6779.